"Dean this isn't funny the voice says I'm almost out of minutes." Wait times vary, but I typically have a 3-4 week waiting period. Around holidays it can be longer. Send me a note or comment and I can update you on the wait time at that moment, but know until I actually place you on the list the time may change. Please contact me at my Etsy shop here: artisticgaming.etsy.com. Even if you contact me on Facebook or on here in order to be officially on my list I'll ask you to contact me at my Etsy shop. How much will XYZ cost? The absolute minimum of custom orders is $100. This will get you hoods, capes, wings, etc. This is for a doll with the average size of 12" tall. Use of chains, buttons, gems, charms, etc will be an at cost extra. Dolls that have unusual shapes, are larger, etc are more expensive and prices given on a case by case basis. Please send me pictures when asking for a price quote. I won't quote you a price on anything without pictures. All price quotes are valid for 2months. If you're on my waiting list and I contact you (through Etsy) to begin work on your doll you have 3 days to respond. If no response your spot on the waiting list will be dropped. I take payment through Etsy via CC or from Paypal. Payment is needed when I start the doll, not when you are placed on my waiting list. I prefer full payment at the start of your doll, however, I can do payment plans. First payment will be the $45 non-refundable deposit. A doll will not be shipped until full payment is received. I ship USPS Priority 2day mail. This includes a tracking number and $50 insurance. You can purchase more insurance if you'd like. I do ship internationally through USPS. I can't track your package once it leaves the US. Buyers are responsible for any and all duties and customs charges that may be incurred. My orders have arrived anywhere from 2weeks to 4weeks. I have just started to give my patterns away! Most will remain free, because I learned from free patterns. I have never made a pattern before so I'm starting out slow. It takes me time to to translate my weird shorthand into correct terms. So please be patient with me as I make them all available. I have started to do videos as well if you'd like to watch me make dolls. How do you make the armor for your WoW customs? This is the hardest question to answer that I receive. Mostly because I don't use the same technique for every doll or piece of armor. My next "The Making of.." video will be a WoW custom so you'll be able to see how I do it. I don't have any patterns yet, but it was suggested to me to do a "base doll" pattern, then have little videos showing how to do various armor. I like this idea, but it will take some time to roll it out. I would love to do more giveaways! The only giveaway I'm doing at the moment will be for Patreons. More info on that below. No I'm sorry. I do not. Do you go to and sell at cons? No, not yet. I kinda live in an area that does not have too many cons. I would love to go and will look into doing this more though. I do go to local craft fairs and shows though. Follow me on Facebook for alerts of shows I'm going to. Colors are a hard thing to find I tell ya. I mostly use Red Heart or I Love This Yarn which is a Hobby Lobby brand. I switch between the two depending on who has the color I need. Both worsted weight. What hooks do you use? The hook I use the most is a 4.5mm G Hook. For smaller detailed pieces I typically use a 3.25 or a 3.75. Go ahead and ask any questions below and I'll add them to the post Thanks all! I just started a Patreon since I'll be doing videos and patterns. Think of Patreon as a monthly subscription. You can choose to donate $5 a month or any amount you'd like. Patreon donators can submit and vote on requests for pattern dolls. They can be added to the credits of videos. Also, they can receive any paid patterns I release that month for free. There are many ways to support me and my work. Following me and engaging with me on social media is great motivation. Links below! Feb 13, 2015 And then there was one..
Sep 27, 2013 Nope.. nope.. nope..
Oct 17, 2012 Slowly gettin back into it, oh ya. Jun 5, 2012 Finally done with the move! Hello! I hope you don't mind my posting on your page today! 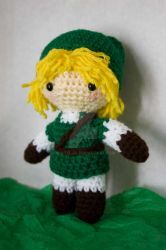 I'd like to invite you to a brand new group; Pop Culture Crochet. 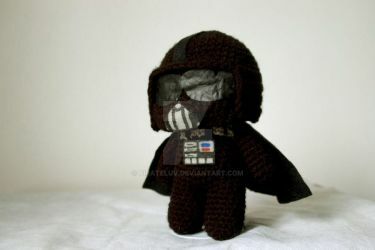 I'd love to make this group a hub for all things crochet with a pop culture spin and I think some of your items would find the perfect home there. Please, help me get this group off the ground! Your dolls are adorable and precious! Love them!